Throughout the early twentieth century thousands of European Jews sailed to Mexico looking for opportunity and escaping increasing persecution at home. A small group made their way north to the border town of Tijuana. Tijuana Jews, is a one-hour documentary and a personal exploration of this community that blended Jewish and Mexican cultures and customs in an unlikely place and time. 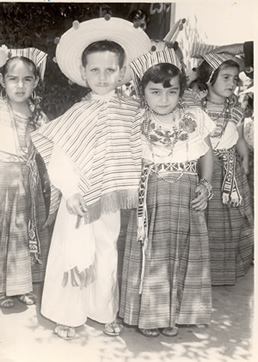 Growing up Jewish in Mexico, director Isaac Artenstein found reactions of surprise, even disbelief, from many people north of the border: they had no idea there were Jews in Mexico, and especially in Tijuana. Tijuana's dark legend continues to fire up the imagination with stories of free-flowing liquor, cheap narcotics, beautiful senoritas and black velvet paintings. Tijuana Jews is an authentic and living testimony set against conceptions and misconceptions of this near-mythic border city. The members of the Tijuana Jewish community are immigrants and their descendants from Eastern Europe --- Yiddish-speaking Ashkenazi Jews from countries like Poland, Russia, Lithuania and Rumania. There are also Sephardic Jews from Turkey, Greece and the Balkans, as well as Arabic Jews from Syria and Lebanon. The interviews in Tijuana Jews provide insights into the experiences of local pioneers who created the first Jewish temple in Tijuana and subsequent congregations such as the Maguen David, The Hatikvah, and the Centro Social Israelita de Tijuana. They also bring to life Tijuana's history beginning with Prohibition in the 1920s when Tijuana gained much of its colorful reputation. This border town boasted the world’s longest bar (one city-block long) for thirsty Americans, the Agua Caliente Casino, the Race Track, and Revolution Avenue. For the film's director, Tijuana was also a place for weddings, bar mitzavahs, graduations and helping out at his father's store on Revolution Avenue. The first-person narration takes the audience in an intimate journey, encountering and re-encountering people and places, while reflecting on a life-long experience that builds to a dynamic present that includes the transformation of Tijuana into the busiest border crossing in the world, and the migration of many Tijuana Jewish families to the American side, adding yet another layer to the rich mosaic that is Tijuana Jews. "Isaac Artenstein's charming memoir of the community of Mexican Jews into which he was born drives home the point that ethnic groups who have been continually battled around the world tend to develop a nimble ability to blend into their host society while gestating the cultural frameworks they require to maintain a separate identity. Over the course of the 20th century, this lively border town attracted Yiddish speaking Ashkenazi Jewish refugees from Eastern Europe, Ladino speaking Sephardis fleeing persecution in Turkey and Greece, and Arabic Jews from Syria and Lebanon. With astonishing rapidity, these diverse cultures fused into a flourishing, sometimes quarrelsome community of Spanish speakers who drew on the colorful economy of Tijuana's tourist district for sustenance, and helped also define it. Artenstein's sources for Tijuana Jews are home movies and interviews with friends and family, who seem a happy, tight-knit bunch whose lavish weddings and bar mitzvahs were invariably attended by the entire community. When, perhaps inevitably, they moved north to San Diego for the sake of their kids' education, they upped the stakes with their secular-bourgeois infrastructure intact."